Euan McIlwraith and Karen MacKenzie for the latest outdoor activities from Shetland to the Borders, plus the key stories for those who live and work in the countryside. After the first case of BSE or mad cow disease in Scotland in over a decade was found on a farm in Aberdeenshire earlier this week, Euan speaks to Charlie Adam, Livestock Committee Chairman for the National Farmers Union Scotland. He finds out about the systems in place to detect BSE and what this case means for the Scottish beef industry. Euan takes a look at the closure of the Cairngorm funicular railway. He hears about the concerns of those who rely on the ski industry in the Aviemore area as well as Highlands and Islands Enterprise who own the mountain. Eaglesham Moor in East Ayrshire is home to the largest windfarm in Scotland, Whitelee. Karen MacKenzie went for a wander on a rather blustery day to see the turbines in action. Starting out working in conservation can be difficult. Jobs are often not well paid, if they’re paid at all. Euan hears about three new jobs created by the John Muir Trust to encourage younger people into the conservation sector. Karen finds out about the world of beekeeping at the Newbattle Beekeepers Association bee academy. Calum Macleod was born in 1911 and his tale of one man’s heroic struggle is pretty incredible. Euan finds out why he’s famous on the island of Raasay from author Roger Hutchinson. 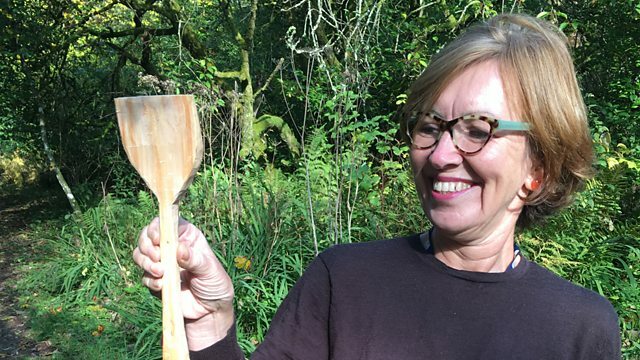 Green Aspirations is a social enterprise with a passion for all things wood as Karen finds out when she turns her hand to making a spatula! Got a bit of DIY needing done in your home or garden but not quite got the right tool for the job? Karen visits the Edinburgh Tool Library, a place that lends out tools so you don’t need to spend a fortune buying them. The finished spatula with its proud owner!